The Shark Heritage is a vintage cruiser / touring 3/4 helmet with bamboo lining and inner, drop-down clear visor. I came from a Shoei RF1100 and after buying my first Harley I wanted to try an open faced helmet. Fit and finish is great and the drop down visor is a nice feature. Having no vents on the lid meant heat and sweat was trapped on my head. On a warm day a proper full faced helmet would've been more comfortable. I ended up replacing this with a Shoei RJ Platinum which is worth the premium. At its sale price, this helmet is a great value. The drop down eye shield is a nice feature. Perfect snug fit. I like the increased visibility of this helmet vs the whole head coverage models. I also bought it because it can accommodate earbuds, but I have yet to try that feature. Saw this helmet, loved the style and bought it on a whim. The price was good, hard to turn down. Really pleased with the purchase, I wear it regularly. Great comfort and vision. excellent helmet. very comfortable, quiet, beautiful finish. 2 things added to it would make it PERFECT: 1. wish it had a vent or two on top (tho great air flow as is) and 2. wish it had come with a darker visor (or at least an option to replace clear one for bright days). Strongly recommend. I got this helmet as I was wanting an open face for hotter weather... I am very happy with the performance overall. On top of being cool on the face air flows well around the head. Only negative so far is there is a little bit of a pressure point on the forehead but that could just be because of my head shape. Good helmet for warm weather. I wanted a helmet with an intermediate oval fit that also made wearing glasses easy. The Shark Heritage fit the bill. Tampa has some incredibly hot weather even in Winter so I wanted an open-face helmet to get a lot of airflow. My first concern though was being sure that my glasses would fit in it. The Shark 'Easy Fit' solution is to take the cheek pads out which I would normally not do, but it makes all the difference. My rectangular rimmed glasses fit under the retractable visor and it opens up a bit more space for air to circulate. Because the cheek pads have to be taken out for the glasses to fit, I do feel that you are sacrificing a bit of protection because the helmet is slightly looser than with the pads in, hence the 4-star on Protection. 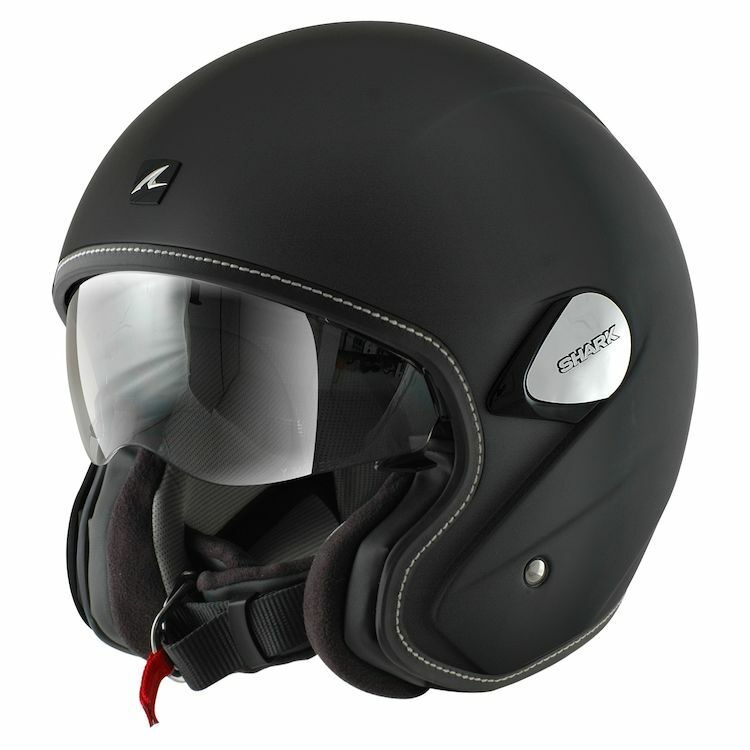 Otherwise, this is a stylish, city-cruising, warm weather helmet that was well worth the price. I've always preferred the visceral experience of a 3/4 helmet. But some of the ones I've purchased in the last few years (mostly AGVs) had poor fit resulting in uncomfortable pressure spots and excessive noise on bikes without windshields. I am happy to say that not only the fit was excellent, the helmet itself is nicely aerodynamic so as to not add to the level of wind noise. Also, the high quality (as well as removable/replaceable) cheek and ear pads fit snug enough to reduce wind noise. I think the noise level is about the same on this as my Arai Defiant. That's not to ever say I would expect it to equal that of a quieter full-face helmet, but it is pleasantly quiet for a 3/4. It's as comfortable on the Monster or V7 as it is on the Harley.